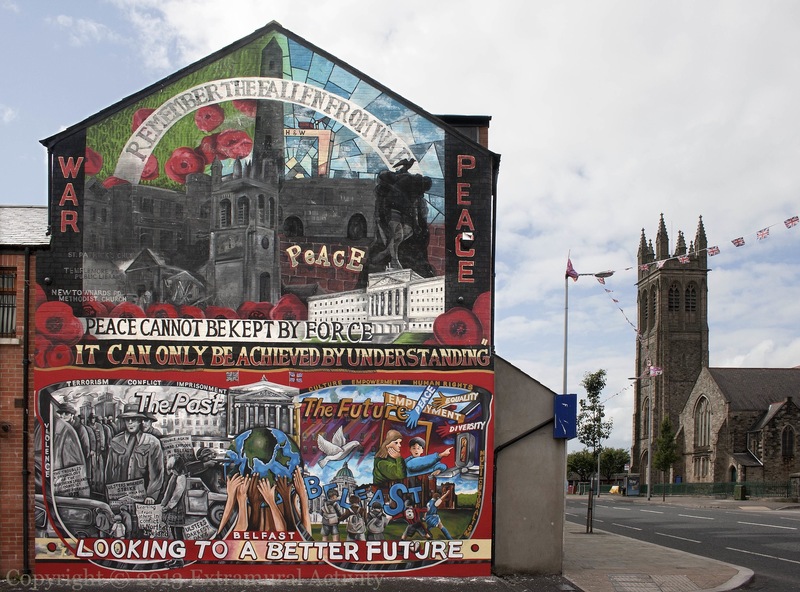 In this new east Belfast mural, we move from a part of “violence – terrorism – conflict – imprisonment’ to a future of ‘culture – empowerment – human rights – multiculturalism’. The mural is black-and-white on one side and colour on the other. On the left we have watchtowers and paramilitaries in hats and sunglasses; on the right schoolchildren in front of city hall, working on a computer and playing football. The mural was defaced immediately after it was finished (roughly the end of July), indicating dissatisfaction with the current direction of ‘the future’, but quickly repaired. There is a mural directly above this one, on Lendrick Street, which was featured previously. A wide shot of them both can be found below.